Grantham Journal 13th July, 1918, article. Robert Mellors was born in January 1896, in the Lincoln registration district, the second child of William Edwin Mellors and Sarah Mellors. In 1901, the Mellors lived at the School House, Alverton, near Orston, Nottinghamshire. William E. (Edwin) Mellors, 38, was a farmer born about 1863 at Hucknall Torkard, Nottinghamshire, Sarah Mellors (nee Clarke) was born at Greasely, Nottinghamshire. At this time, they had two children, Edna L. Mellors, aged 8 (b.1893), and Robert P. (Paul) Mellors, aged 5 (b.1896), both born at Alverton. In 1911, they still lived at Alverton. In addition to Edna and Robert, there were Winifred (8), Archibald (4) and Kathleen (2), all born at Alverton. Edna was described in the Census as a farmer’s daughter, Robert as a farmer’s son. It is clear that the Mellors lived at Alverton, Nottinghamshire, for several years before the outbreak of war. However, newspaper reports from 1918 describe Robert as being from Highfield House, Bottesford, and formerly of Alverton. This is taken to indicate that his family had moved to the Bottesford address by this time. Highfield House is now known as Highfield Farm, and stands north of the old main road to the west of the village itself. Few service records have been located for Gunner Mellors. A transcript of the Medal Index Card for Robert Mellors, Gunner 127616, Royal Field Artillery, records that he was awarded the Military Medal. The Gazette record of his decoration was published on the 16th July 1918. 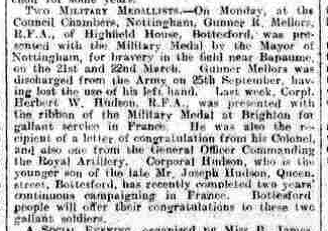 On the 13th July, 1918, the Grantham Journal had carried the following notice: Gunner R. Mellors, Bottesford – Gunner R. Mellors MM RFA, son of Mr & Mrs Mellors, Highfield House, Bottesford, and formerly of Alverton, Notts, was wounded in France, on Jan 6th, in the left arm and ankle, and is now in hospital in Glasgow, where he is doing well. He has seen two years’ service in France, and was awarded the Military Medal for devotion to duty on March 21st and 22nd last. Then on the 19th October, 1918, the Grantham Journal gave the following report: On Monday, at the Council Chambers, Nottingham, Gunner R. Mellors RFA of Highfield House, Bottesford, was presented with the Military Medal by the mayor of Nottingham (Councillor J G Small), for bravery in the field near Bapaume on the 21st & 22nd March. Gunner Mellors was discharged from the Army on 25th September, having lost the use of his left hand (he had actually lost his left arm). The occasion was also reported on 14th October 1918 in the Nottingham Evening Post: There was going to be an outdoor parade but the weather made it impossible so the ceremony took place in the Council Chamber and troops were assembled at the Exchange entrance and on the stairs leading to the Council Chamber. 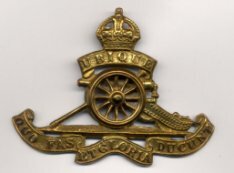 There was also a mention in the Bottesford School Log Book on October 18th 1918, which said: a former scholar, Gunner Robert Mellors RFA, has been awarded the Military Medal for gallant service in France in July, 1918. In Spring 1923, William Edwin and Sarah Mellors lived at Orston, but none of their children were recorded at this address. However, by Autumn 1924, William Edwin and Sarah Mellors had been joined by their son Robert Paul Mellors at Orston. In 1927, Robert Mellors married Bertha Elizabeth Sneath in Lincoln. The register of 1939 includes Robert P Mellors, described as a farmer with a Disability Pension, and his wife Bertha E. Mellors, at Vine Farm, High Street, Newark Rural (Markham). He died in June, 1977, at Birmingham, aged 81.